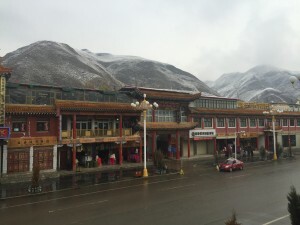 The town of Xiahe, in one of the four Tibetan regions of China, has been the most memorable part of my cross-cultural. 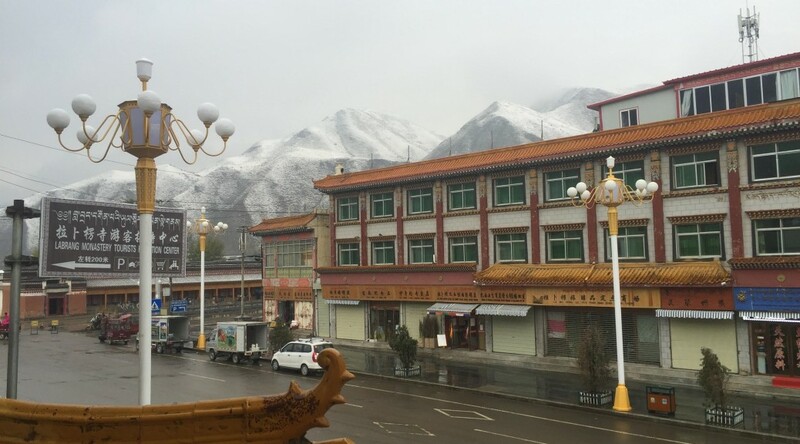 Only accessible by winding, rarely paved roads, Xiahe (Shah huh) is set back in the ridged steep mountains covered with auburn leaves and evergreen trees. The culture alone was completely different from anything I had ever been engulfed in: monks wandering together in their deep red robes, chanting prayers under their breaths as their hands slid up and down their beaded necklaces; children running through the streets in animal fur, cheeks red from the brisk wind; the sidewalk covered with merchants selling wool, cashmere, and trinkets; not a single building over three stories. The ruralness of the region had me thinking about my home in the mountains, but the people and buildings looked like how I envisioned a foreign mountain town. When visiting Xiahe, we travelled to a 2,000-year-old village set in the middle of the most beautiful grassland I had ever witnessed. After climbing the ancient city wall I could look out and see where civilization met untouched nature. I didn’t see anything that was westernized and, for the first time in China, I had seen something entirely self-sustainable set in a few acres. The farmers used their bare hands to plant and harvest their crops. The shepherds walked with their flocks of sheep up and down the grasslands and through the small village. The most profound thing I saw was smiling children playing with each other and a sense of community that was set far beyond the reaches of a big city. After spending a day in the grasslands, feeling the spirit of the land and the people, the owner of our hotel, an ethnic Tibetan, gave us a personal testimony about the suppression he and his people had gone through culturally and individually. When reflecting on the conversation, I found a lot of questions coming to mind about the country I was spending three and a half months in. Why do people in the West not know about the difficulties these people endure? What could China possibly gain by suppressing a minority in a mountainous region when they are one of the most powerful countries in the world? For me, the Tibetan plateau raised more questions than answers, but there is no denying the inherent beauty of the people who live there. Visiting Xiahe was an amazing experience. I was so nervous as I waited to be claimed by my host family. It felt as if I was a young child in an orphanage waiting to be adopted. As my family approached me, I was relieved that the mother was there and they looked fairly young. My first impression was that they were very friendly and they seemed wealthy, because their car and clothes looked expensive. They did not speak English very well, and my Chinese was even worse, so I was worried about how we would communicate. As soon as we got home the mother had to go to work which upset me, because I did not know how to talk to the father or two children. I spent a lot of time looking around, because their home was so modern. The apartment building consisted of thirty-seven floors and is surrounded by restaurants, shops, movie theatres, and even karaoke bars. A few hours had passed and it was dinner time. It was then that I got to meet the whole family. The grandparents cook and clean, the mother Ivy and her husband worked, and the children were very entertaining. Evan, who is 9, usually dances and sings as Didi (who is two) just points and laughs at absolutely everything. It seemed like everyone had a role to play in the family. The food was always very good and usually included rice, some type of meat, a vegetable, and green beans, which are my favorite. I liked everything about the family but I wanted to find a way to connect with them on a deeper level. Days passed and we were not doing much together because of the parents’ work schedule. Finally, the father and children invited me to walk around the garden area outside of the apartment. As we were walking I came to the conclusion that maybe I should change and become more open. When the mother was home, I would try to talk to her until I was ready for bed. She tried to teach me Chinese while I would teach her English. Going out together was my favorite time. The first place was karaoke with her colleagues which was very fun because there were a lot of American songs for me to sing. Some of her co-workers knew English, so it was great to have a translator. The next time we went to a hot pot restaurant, which was amazing. After hot pot we ended up at a movie theater to see “Mission Impossible 5.” I was excited because I was waiting to see the movie and it was in English which made it ten times better. Next weekend we have plans to get massages with hot rocks and go hiking up a mountain. I am very excited to see what other places we plan to go. I am feeling a lot more comfortable since we are spending more time together. When the time comes to leave, I know I am going to miss them very much. Overall, I like my host family a lot and I am excited to see what the future has in store for us. 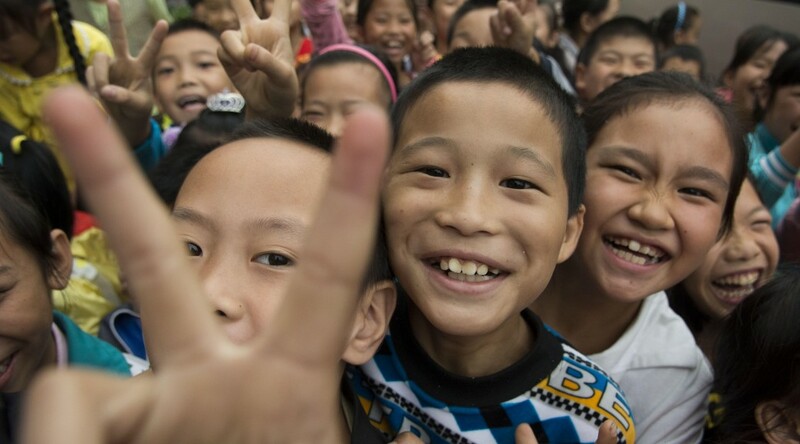 The first thing you need to know about Nanchong streets is that they are filled with people, especially in the evening, especially on weekends, and especially at lunchtime. Now, when I say, “The streets are filled,” I don’t mean every single street – far from it. For a city of 1.3 million people (on par with Dallas), Nanchong feels decidedly uncrowded, especially compared to an American city of similar size. The places where Nanchong does live up to its size, however, are perhaps not where you would expect, especially if you have grown up hearing a Western narrative of China. So where, then, are the people of Nanchong? Are they at the new underground shopping area at the center of the city, or the sparkly shopping mall downtown that looks unsettlingly like an American Sears? Or even the large McDonalds on the corner of the busiest intersection in the city? Well, no, not really. This is not to say that there are no people in these areas, because there generally are, but there are a lot fewer than the stereotypical view of an “overcrowded consumerist China” would lead you to expect. 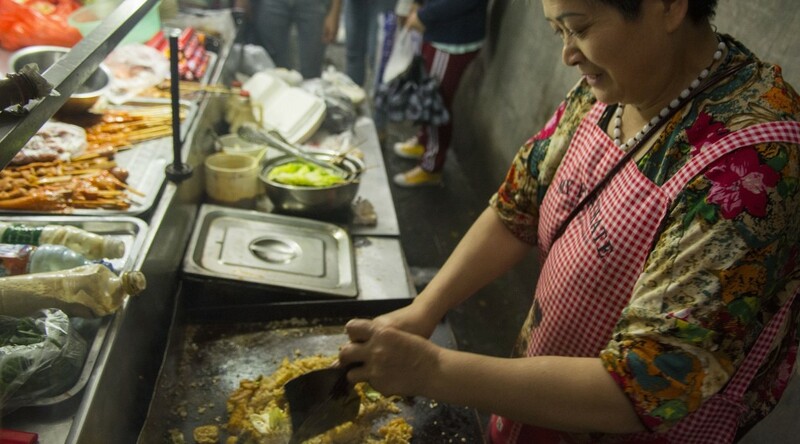 Instead, the places most frequented by Nanchong citizens are far more community-oriented. Of these, the most notable are, as we call them, the “food street,” the “market street,” and the parks. These are the places where the true spirit of Chinese culture shines through, debunking American media’s favored narratives of totalitarian oppression and consumerist culture. The food street, right next to our university, is lined with food carts and noodle shops (here, a bowl of noodles can cost as little as $.75), and full of good-humored college or high school students. On another street, closer to my apartment, an entire three blocks of sidewalk (clear for most of the day) spontaneously transforms into an open-air market every afternoon, as peddlers bring in their wares on an assemblage of rickshaws, carts and scooters. This same street, in a remarkable show of fluidity, changes again around 6 p.m., turning into an open-air hot pot restaurant. And the parks! At a park in Nanchong, one might join a crowd in listening to a man practice his karaoke skills, watch a group of people participating in a spontaneous line dance, or appreciate music drifting from a local band’s weekly street-side practice. But the most striking part of it all is the thousands of other Chinese who are simply content to be alive and to be outside, strolling happily with a friend or spouse. This is where the people of Nanchong are, and this is why Nanchong feels so strikingly different from any American city I have ever been to. In all of these places, the buoyant spirit of the Chinese manifests itself in a way that reflects in stark contrast with the typical American view of China and its people. Call it consumerist if you like, but it certainly is not American consumerism. It is China. To distill it to anything less, anything else would be unfair to the unique spirit and palpable humanity that pervades modern Chinese culture. On Sunday, our second full day in Beijing, we boarded the subway and headed to the Forbidden City. I was standing on the escalator when several people from our group asked for someone who could speak Spanish to join them. I immediately made myself known. 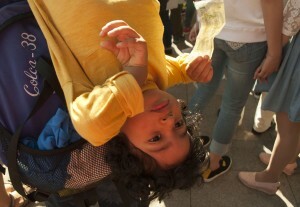 A lady pushing her two-year-old son in a stroller asked where she could exchange her Euros for Yuan. Ling (one of our leaders) provided the Yuan needed and soon the lady was walking with us. She was elated that I spoke Spanish and began telling me her story. “Andréa” is a single mother who works as a nurse and was traveling to Beijing on her vacation. 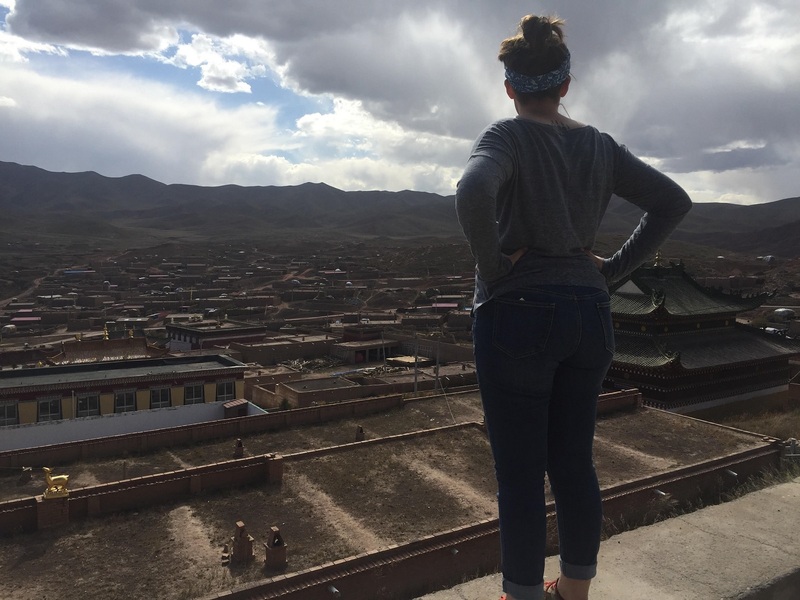 She didn’t speak Mandarin and knew little English, which resulted in no breakfast, poor lodging conditions and a morning’s struggle of trying to get to the Forbidden City. Not too long into our conversation, she asked me where I learned Spanish. I responded that I had lived in Cusco, Peru for six years. Her facial expression changed from curiosity to deep joy and then tears of gratitude as she told me that she was from Cusco. She had been praying for someone who spoke Spanish, and God went above and beyond to meet that need. 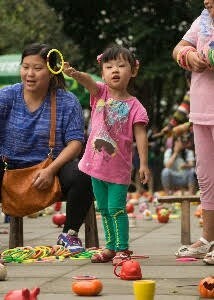 I wondered what she was doing in China with an energetic toddler who would constantly jump out of his stroller and escape through the crowds. Andréa was recently divorced and traveled to distract herself from life. Andréa’s faith was so strong and she believed that God would take care of her. She explained that though she once was a Seventh Day Adventist, she was no longer tied to a specific religion, but strongly wanted her son to have faith in God. Andréa and her son, Inti, entered the Forbidden City with us, but once we were inside we split ways. It was very clear to me that this was a divine appointment used to help Andréa and to build both of our faiths. I left thinking, God has such a great sense of humor. 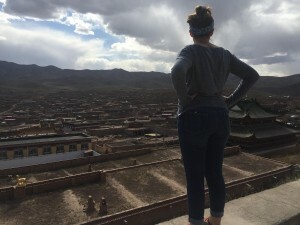 Living in China has been a dream of mine since I was nine. I had been asking God what I could do in China with my God-given gift of Spanish. This encounter with Andréa showed me His goodness, provision and faithfulness to answer prayer. We arrived in Beijing at about 5:30 pm (5:30 am EST) on Friday feeling very groggy but still overwhelmed at the fact that we were in China. We ate our first authentic Chinese meal, Beijing Duck, and then fell into our hotel beds exhausted. Our first full day was slightly rainy but filled with exciting adventures. 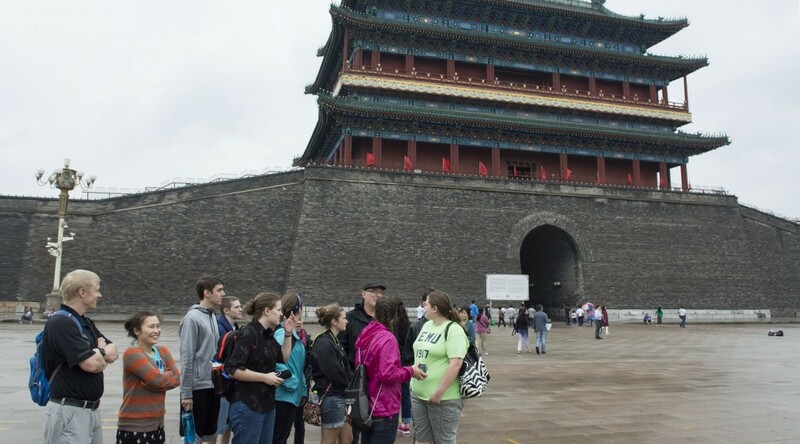 We started the day by taking our first bus ride to Tiananmen Square. (For anyone who is wondering, the buses are just as crowded as you think). 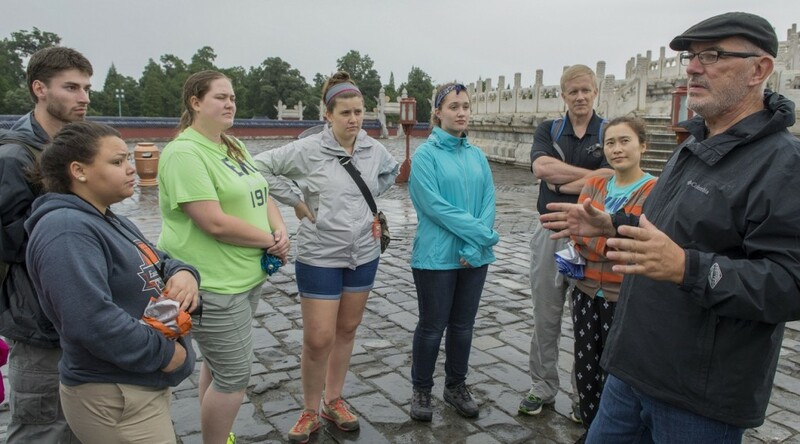 Next, we went to the Temple of Heaven, where the Chinese Emperor traditionally held ceremonial sacrifices, and then a few of us haggled for “name brand” merchandise at Pearl Market, a mall popular among Westerners. The next day was Sunday, so we went to one of the only churches in Beijing that has an English translator. Church services tend to last a little bit longer in China, but the interpreter provided an excellent translation and joined us for lunch afterward. Then we walked around The Forbidden City, a lavish and gigantic palace in the heart of Beijing. That afternoon, Myrrl set us loose on Wangfujing Street, a very modern-looking area with several shopping centers and roadside food stands selling foods ranging from chips on a stick to giant spiders. We spent Monday on the Great Wall, hiking about 4 miles of steep ascending and descending stairways. The sheer size and scope of the Wall and the surrounding mountains left us in awe. While tiring, it was exhilarating to be at a place that we had heard so much about and that had such an important place in China’s history. On Tuesday, our last full day in Beijing, we visited some smaller attractions, providing a nice contrast to the important historical sites we had been visiting. We went to the Summer Palace (where the Dowager Empress spent her time), the Olympic Park (where the Bird’s Nest is located), and to Houhai Lake (a market area). After four days of tourism, fried noodles, and impressive skylines, we flew out of the capital city en route to Nanchong – our next destination.